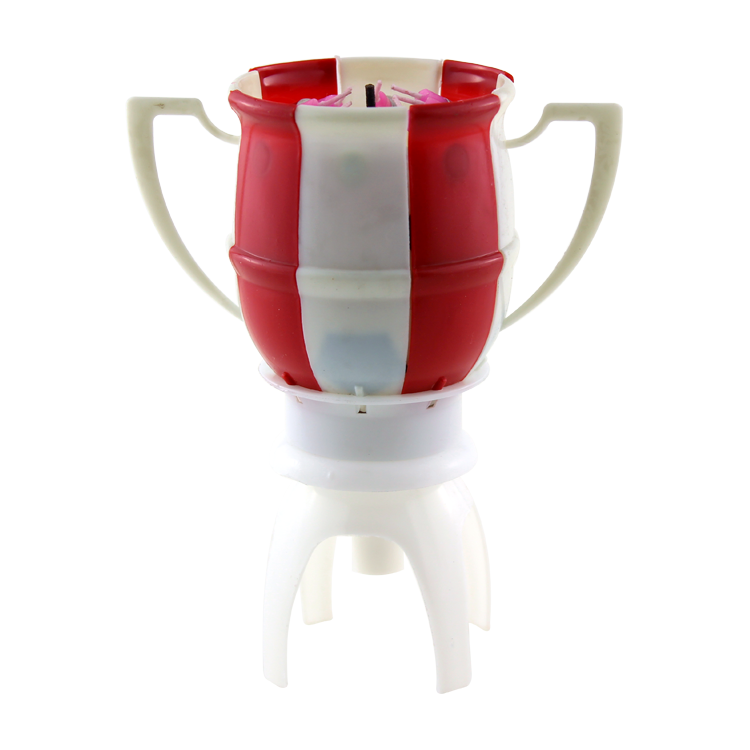 The original Football musical birthday candle is available with 8 inner candles and petals in red, pink , yellow , blue , purple ,white or rainbow.The flower musical birthday candle is our main product. We export the product to foreign country a big quantity a year. The original amazing Football musical birthday candle first appears as a closed soccer ball cup. Once lit, the center flame lights smaller Birthday Candles attached inside to individual flower petals. Then the lotus flower opens up and spins to the tune of "Happy Birthday" on a wide plastic foot which sits easily on top of a cake. Not re-usable, one time use only. Sold individually. TURN OFF MUSIC: You can omit the Happy Birthday song playing before or after lighting by cutting the internal copper wire with scissors or take the music device out . Use for any soccer, football or golf event, anniversaries, farewell, homecoming, graduation, and retirement parties. FOOD: Approved for use with foodstuffs by the FDA. NOT REUSABLE: The musical birthday candle is for one time use and is not reusable. You must use the enclosed lighting stick to ignite the center, below the candle wicks. If you light the candle wicks instead, the candles and plastic petals will melt into an amazing mess. Extended reach lighters will light the candle wicks, please use the lighting stick. 1.Due to the differen:ce between different monitors, the picture may be slightly different from the atual c:olor of the item. We guarantee the style is the same as shown in the pictures. Looking for ideal Candles with Battery Manufacturer & supplier ? We have a wide selection at great prices to help you get creative. All the Firework Musical Candle are quality guaranteed. We are China Origin Factory of Music Player Candle. If you have any question, please feel free to contact us.